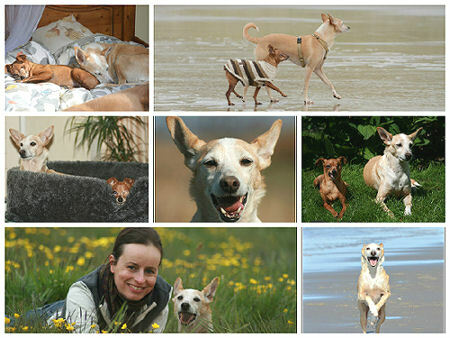 A few weeks after Simba arrived, January 2005, Irene saw Emi on the internet and her heart did go out to her. She had such a ‘damaged’ soul, and this while she was still so young… Together with her little brother she was thrown into a deep trench in Spain, where her brother broke his leg. They were found and taking care of and at the age of 3 months Emi traveled to the Netherlands to a foster home. Maybe you know the feeling that your mind keeps saying it’s not okay to do something? Well, Irene her mind kept telling that it couldn’t be good to adopt Emi so quickly after Simba. But her heart kept telling something different and in the end her heart was stronger. It’s always best to listen to your heart! So, three months after Simba Emi arrived at her forever home. She was very scared and did keep her distance. She is such a sensitive girl. But on her own time, she found out more and more that she will never be hurt again. The only one she trusts for 100 % is Irene, she still doesn’t like other people so much, she will just watch them from a distance. That’s okay, she can make her own choices. Even so she has grown a lot, got a lot more confidence and above all, she enjoys life! She can be such a happy girl. Sometimes she plays ‘the three musketeers’ with Simba and Benji, so funny. I like and love Emi a lot, I’m always happy when I feel she’s around me.